Because of the hype surrounding prom, many teens will share more about their plans and activities than they normally do. They may want to show pictures of their outfits, the various stages of getting ready, and even silly things like the storefronts of businesses they used to purchase dresses or rent tuxes and vehicles. Along the way, they might fall into the trap of oversharing these details. In addition to prom itself, after parties are another activity that these young people want to share with others. Pictures of where they are going, the decorations and who has arrived often fill the content they want others to see. A couple of problems can happen with this type of continual sharing throughout the evening. First of all, kids may actually miss out on what is happening. Secondly, they are alerting not only their friends, but also potentially others about their activities. Each of these can have long-term repercussions for the youngsters. Capturing the Moment Or Missing the Moment? By continually taking pictures and writing messages, they may not actually be able to focus their attention on the events at hand. 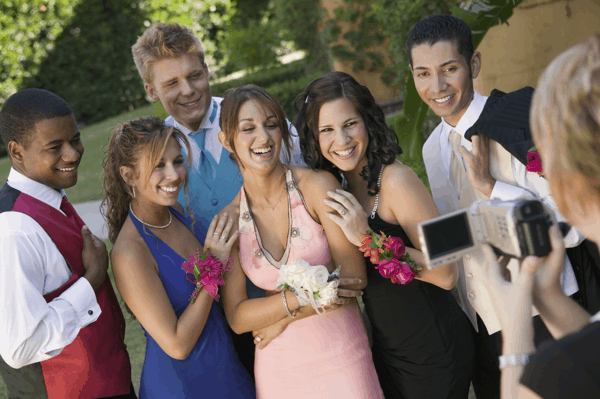 While getting images to share is a great thing, if a teen is so busy doing this that they are not engaging in the fun, they may find that they have fewer memories of prom and the party afterwards than they do of using their tablet or camera. It can turn exciting party memories into something that they wish they had been more fully in-tune with while it was happening. Additionally, there is a huge problem with others knowing about their activities. Pedophiles and other types of stalkers often monitor proms and similar events in an attempt to find victims. Kids that post where they will be throughout the night are alerting these dangerous individuals where to find them. Even if your child is using all of the right privacy settings in their social network accounts, photos and content are often digitally exchanged with other kids on prom night. When something is sent to another person via texting or simply by being displayed on another's social media news feed, it is placed in that person's hands. Even the best social media privacy settings don't change the fact that members of your teen's networks can do what they please with shared content. On prom night, it's just as important as other nights for teens to be conscious in deciding what to post or share with friends. As a parent, it is important that you begin discussing your concerns before the day of the event. Let your teen know that you are interested in their safety while still wanting them to have a great time. Talk about the various things they can do in order to minimize risks of oversharing on prom night. For instance, they should not announce the expected times of arrival or departure to prom or the after-parties. This type of information can be shared the next day, when predators will no longer be able to reach them. Waiting a few hours to show off funny pictures is certainly a far better option than risking being caught unaware by a predator while entering or leaving a venue. Additionally, reminding your teen about the importance of safety in numbers is a wise idea. They should never travel alone from one place to another, even if it is just down the street. Let them know that it is not because you do not trust them; rather, it is about the other people that may be watching their moves. Taking the time to review your family emergency plans is a good idea as well. Make yourself available that night for them to call or text should anything appear amiss throughout the night. Stay sober and remind them you will not judge what is happening if they need to contact you. Make sure that you are aware of what your child is doing and posting on prom night by installing uKnowKids. Get started on your 7-day free trial today!